UPDATE, 5:30 p.m.: Jeff Teague will not play for the Wolves tonight because of a sore knee, but Derrick Rose is available to play after he missed five games because of a sprained ankle. "See if they need me or not," Rose said before the game. WIth Teague out, that's probably a pretty big yes. Tyus Jones will start at point guard and Ricky Rubio will play and start for Utah after he warmed up his sore hamstring and deem himself ready to play tonight. As of late this morning, about 500 tickets remain for Easter night's Wolves-Jazz game at Target Center that has all sorts of playoff implications. The Wolves head toward it with both starting point guard Jeff Teague and backup Derrick Rose called game-time decisions by coach Tom Thibodeau. The Wolves' last injury report both as questionable -- Teague with a sore right knee and Rose still with that sprained right ankle. "There's a chance," Rose said when asked if he'll play. "I just have to make sure that it's right. I've been through enough injuries. I think I know my body. I just want to be smart and pay attention to everything." Jimmy Butler remains listed as out. Thibodeau called Saturday a "recovery" day for him and said today will be a heavy conditioning day and he'll participate in 5-on-5 conditioning this week. The Wolves next game after tonight is Thursday at Denver. 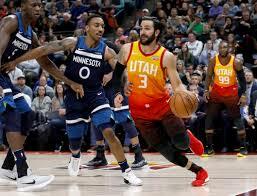 Former Wolves point guard Ricky Rubio (left hamstring soreness) is questionable for Utah. He did not play Friday against Memphis. Right now -- and in the Western Conference it's always subject to change -- the Wolves are in fifth place because of their tiebreaker advantage over sixth-place Oklahoma City. Both have identical 44-33 records and the Jazz are in seventh place a half-game back. When these teams last played a month ago in Salt Lake City, both Teague and Karl-Anthony Towns as well as Utah's Jae Crowder were ejected from a game that grew testy. "It's competitive," Thibodeau said. "They’re a hard playing team. Hopefully, we’re a hard-playing team. Everyone’s fighting for the same thing this time of year. It's competition. We want it to be hard. We don’t want it to be chippy, but just play hard."